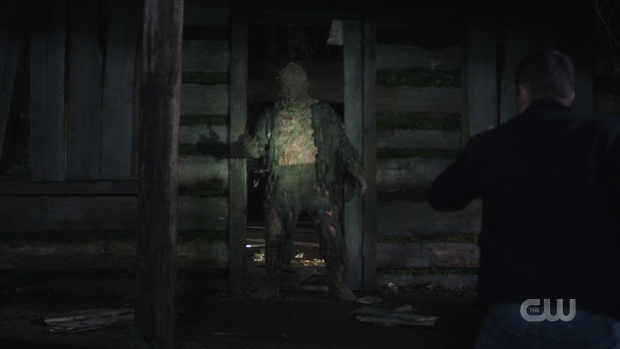 Supernatural introduces a brand new monster and lets Jack hang around with people close to his physical age. There isn’t a lot to say about the Sam and Dean portion of the story. All in all it’s a fairly serviceable monster hunt narrative that the writers can probably pull off in their sleep by now. The inclusion of Native American mythology in the background of the Kohonta (Andrew Long) is interesting enough and the idea that there are things out there that our heroes haven’t encountered yet adds further scope to the world they live in. Despite their lack of knowledge on this specific monster, there are a number of basic rules that they can follow in their attempts to put an end to it which further reinforces their experience and shows that this is a fairly bog standard hunting narrative even when considering the newness of the monster. Interestingly it seems to share a lot of background with the Wendigo -introduced in the second episode of the series- albeit with a Native American twist as well as a degree of tragedy as the Kohonta is basically a corrupted Human that ended up being driven mad by circumstances and punished for actions taken as a result of insanity. It’s a fairly bleak origin story and works fairly well as a back story but ultimately doesn’t set itself apart in terms of threat value. This is the folly of such a long running series that decides to return to the formula periodically; it’s very difficult to surprise the audience with the mechanical aspects of the narrative. There is some intrigue in the form of unexpected and difficult questions posed to the Winchesters by Sheriff Mason (Adam Beach). Once he learns that monsters exist and processes that fact he asks Sam and Dean why they hunt in secret instead of telling everyone about the things that are out there preying on them. Sam and Dean dismiss this outright because their experiences have taught them that people struggle to accept the truth and wind up dead regardless so it’s better that they don’t know about it. This is a debate worth having so it’s a shame that the episode only touches on this briefly with Sam and Dean both sticking to their guns on their decision to keep working in the shadows rather than putting evidence of the existence of the supernatural on the internet for all to see. Perhaps there will be an episode where they try this and are considered to be creating elaborate hoaxes. Of course it’s possible that the existence of the supernatural being common knowledge could end up being part of the endgame for this show following the recent announcement that next season will be the last. Either way the discussion is an interesting one with Mason making some good points. Having him come to the understanding that the truth may be too much for some as shown by him not telling his son what actually happened appears to put the argument to rest at least as far as Mason is concerned but I’d like to see this linger. This hunt is actually a great example of why it might be important for the truth to be known to more people. The Kohonta was able to prey on people for such a long time because the details of its existence had been largely forgotten. It was a local myth that was known about to some in the area and the forest was marked to warn people to stay away but time had meant that the details had been forgotten therefore renewing the threat. If the general public knew about supernatural threats then arguably it would be more difficult for information like this to be lost through time as more people would be keeping records of it rather than it dying with the select few that knew the truth. The message of this episode is that the truth is a bad thing though so it’s not something that will be explored at this time. Sam and Dean’s hunt serves as an excuse for Jack to go on his own adventure that involves interacting with people close to his physical age. This is something that he has done almost none of in his brief time being alive so seeing how this plays out is interesting. He hangs around with Max (Skylar Radzion), Stacy (Zenia Marshall) and Eliot (Cory Gruter-Andrew) who make their return following their introduction in “Lebanon“. I really like them as characters; they bounce off one another naturally which makes it believable that they are friends with a history. The attraction between Max and Stacy is a really endearing way to add texture to this group of young characters. In general they come across as bored kids having very little to do in a small town which largely defined their introduction a few episodes ago. 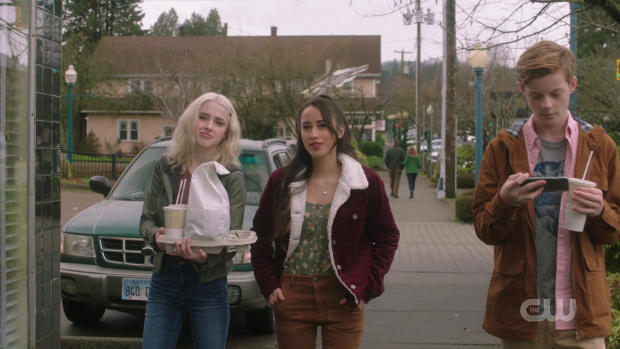 They speculated about Sam, Dean, Castiel and Jack because they have nothing better to do and the idea that there are mysterious strangers living nearby is enticing to their imaginations. This adds to helping them feel more fleshed out as characters while offering a different perspective on the lives that the main characters lead. Jack meets them when on a supply run and finds himself welcomed into their group with ease as they are fascinated to learn more about him. There’s no getting around the fact that Jack would be odd to normal people as he has only been alive for 2 years and has a really skewed perspective of the world based on the limited number of people he has learned from. He never had a childhood and never went to school so basic social interactions are an elusive concept to him because he has no idea how those around his physical age interact. As such this experience is fascinating to him and he approaches it with the same wide eyed curiosity he does with everything else which makes him seem more than a little weird to the group. It’s a fun dynamic that the writers clearly enjoy playing with and makes for some entertaining moments. 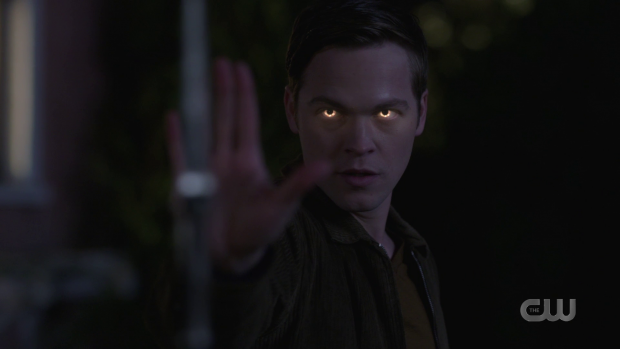 Naturally the group are interested in the supernatural and have some knowledge through the Ghostfacers -offering an example of Sam and Dean’s point about the general public not being able to handle the truth- so naturally lap up Jack’s first hand knowledge of what they’re interested in. He’s all too happy to oblige them with stories of what he has encountered. He eventually elects to show off his powers by manipulating an angel blade out of a desire to impress them with his abilities. This proves to be too much for them and results in Stacy being mortally wounded before Jack heals her. This adds to the cautionary tale against telling the truth as Max, Stacy and Eliot clearly couldn’t handle the full scope of what they thought they wanted to know about which led to Stacy almost being killed. It was completely an accident and the details around why it happened made a lot of sense considering Jack’s desire to impress those near to his physical age but it serves as a powerful example of why secrets are kept from those who can’t handle facing the truth. It ends up being a strong lesson for Jack who only wanted to be accepted and ended up being ostracised for showing his true self. Granted he could have stopped showing off when fear was expressed but it’s reasonable to assume that Jack doesn’t have that level of understanding because of his still naive outlook on the world around him. This is his first time spending a great deal of time interacting with people close to his physical age and has no analogue for how to behave in such a scenario so it makes sense that he would be overwhelmed by the influx of emotions associated with this. Whether these characters will return to either cause problems for him or forgive him in some way is anyone’s guess but within this episode it’s an effective example of why he needs to take care. The question of whether Jack has a soul or not is still lingering in the background. Sam and Dean benched him because they don’t want him in the field until they can be sure he can be trusted with his powers again. They can’t afford fatal mistakes so are taking every precaution. Little did they know that different problems were being invited by doing this. There is tension associated with a potentially soulless Jack interacting with innocents as it’s possible he has no concept of the right way to treat them. 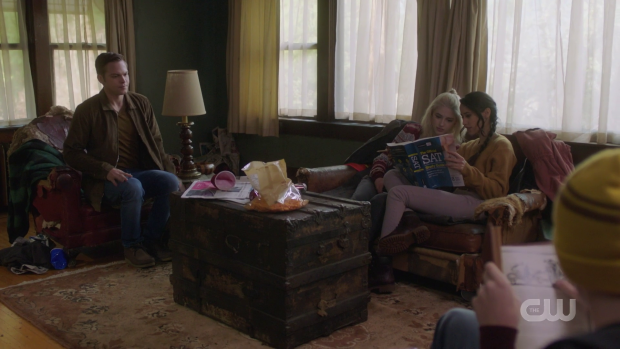 He clearly shows remorse when Stacy is injured which leads to him healing her but it’s unclear if it’s genuine remorse of if he’s remembering Donatello’s advice from last week and simply considering how Sam and Dean would react. Killing the snake last week was an act of mercy in his mind so healing Stacy could simply be a conclusion that he draws by imagining how Sam and Dean would react in such a situation. This is still up in the air and has potential to go either way. The fact that he lies to Sam and Dean about what went on in their absence is naturally troubling and it’s unlikely that his promise to not use his powers until further notice will stick for very long. An interesting episode that adds a compelling debate to a bog standard hunting narrative and delivers fascinating new ground for Jack to explore. The mechanics of the hunting narrative are really nothing new though having Sam and Dean encounter a monster they’ve never heard of expands the scope of the world they inhabit while showing that their skills are transferable. The new monster resembles a Wendigo in terms of background but also has added Native American mythology that adds the newness. Outside of the hunt there is an interesting debate about revealing the existence of the supernatural to the general public. It’s resolved very quickly but it’s definitely something that deserves further coverage in a later episode as the idea of information being lost over time after those in the know die is touched on. The concept of hiding the truth is backed up in Jack’s story as being honest with the group of kids he interacts with ends up leading to one of them almost dying. This works really well as Jack’s naivety because of his lack of life experience comes across clearly and informs the interactions he has with those close to his physical age. The three kids are really well characterised with natural interactions and an endearing attraction between Max and Stacy. Jack’s desire to be liked and learn more about those outside of the limited examples of humanity he has. The question over whether he still has a soul lingers over this plot as well and it’s clear that the promise he makes to not use his powers won’t stick for long.